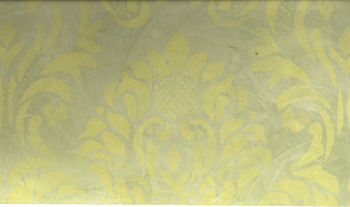 In 2001, Buon Fresco introduced its Faux Damask Fabric executed entirely in Venetian Plaster. This is a beautiful application of 2-sheend of plaster in classic fabric design patterns. 'Utterly impressive', 'Masterfully done', 'Like no walls we've ever seen'. These and other similar comments are the reaction of magazine publishers, decorators and other industry insiders who have seen Buon Fresco's Damask Work. .......................................... ........... What makes these walls so beautiful is not just their elegance & detail, but how unusual they really are. We achieved this by using a Mushroom Stenciling- Tool to apply Matte Venetian Plaster through a Mylar Stencil, to the top of a polished Venetian Plaster base recreating the light play of a Damask fabric. Note the 'Damask' style play of light on the wall detail (above). The subtle reflective plaster surface creates a lyrical medley of color and design.